The Dorset 100 merchandise is still available and will continue to be available for a few months after the event. We are not handling the merchandise; if you want to order some merchandise, you will be buying it directly from the supplier. The price for each item includes postage and packing. Go to this link to order. When you come to check out, you will see the page below. 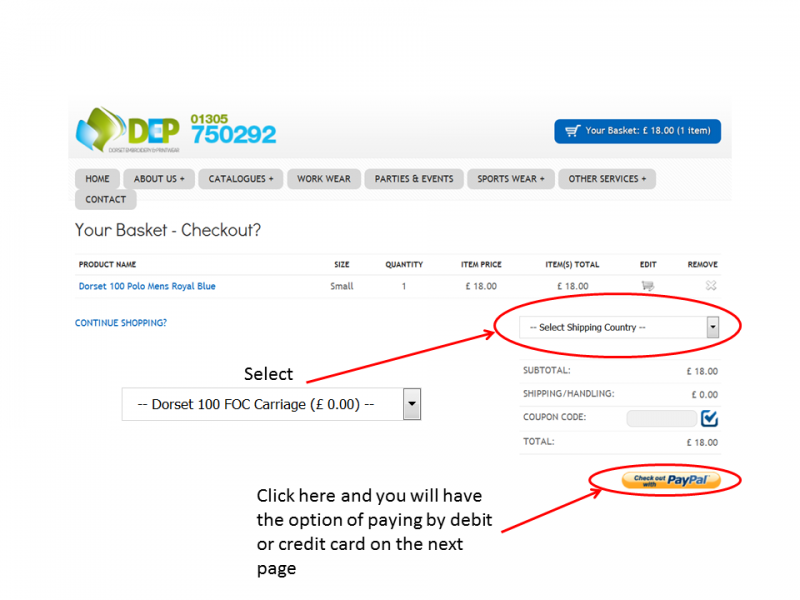 Make sure you select "Dorset 100 FOC carriage" under "Select shipping country", then click on the "Check out with PayPal" icon. You will be offered the opportunity to pay with a credit or debit card if you do not want to pay with PayPal. Fruit of the Loom sweatshirt with a quarter zip in colors of navy blue, bottle green, or black. This has an embroidered Dorset 100 logo. Blue Max polo shirt in colours of navy blue, royal blue, or turquoise (jade). This also has an embroidered Dorset 100 logo. It comes in men's or ladies' fit. Wicking T-shirt in white. The T-shirt has a printed (slightly different) Dorset 100 logo on the front and a map of the Dorset 100 route on the back. It also comes in men's or ladies' fit. The photos below show some of the options so that you can see what you are ordering.